HandiSOLUTIONS® offers complete storage and organization systems for garages, utility and laundry rooms, and even basements to fit all of your needs. 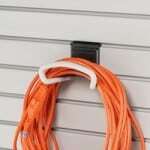 We offer an extensive line of accessories to cover every application and need, for all of your storage solutions. HandiWALL® is the cellular PVC slatwall designed to organize your life. It is installed in full 8’ or 4’ panels. The panels can also be cut to size to fit tighter storage spaces. Used as a complete wall or as a complement to your existing home storage, HandiWALL® allows a flexible layout that easily adapts to your storage needs. 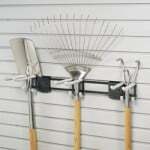 Keep the garage clean by hanging everything from power tools, rakes and cabinets on the HandiWALL® system. If it gets dirty, spray it down with a hose. HandiWALL® is impervious to water and the unique profile prevents water from pooling at the bottom of the slat. 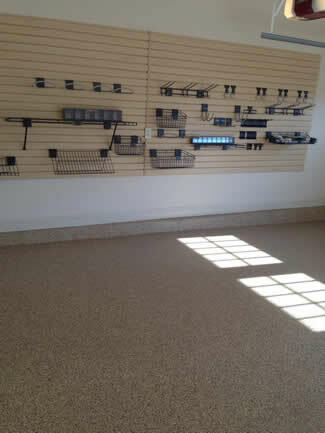 HandiWALL® allows a flexible layout that easily adapts to changing storage needs over time. HandiSOLUTIONS® offers complete storage and organization systems for garages, utility and laundry rooms, and even basements to fit all of your customers’ needs, directly from a single source. 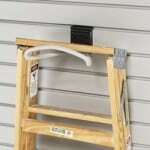 Our storage system includes HandiWALL® slatwall panels, baskets, hooks, shelves, tilt bins, tool holders, folding work bench, trim extrusions, mounting hardware, plus an extensive line of accessory items. The HandiSOLUTIONS® system is flexible with all storage units designed to be mounted onto the HandiWALL® slatwall and can be easily moved to fit changing needs. The garage has long been a multi-purpose space and sharing that space can be a challenge. Car enthusiasts use HandiSOLUTIONS® to showcase and protect their cars. 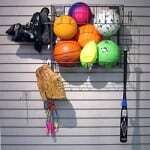 Families find a clear path to the minivan when toys are stored in racks and ball nets. Craftsmen and woodworkers install clear bins for hardware, hooks for tools and wire bins for lubricants and chemicals.